After a day or two of rest at base camp, I resumed my daily walks up to the first fixed rope. 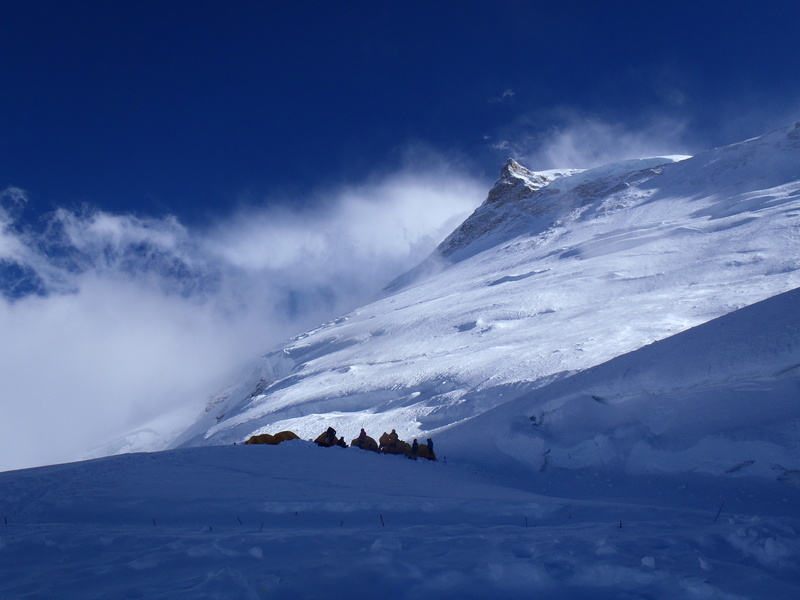 They were no longer quiet: helicopters hovered above Manaslu, people were talking, tents – rustling as they were being packed away by the departing teams… Five members of our group, too, decided to leave the mountain for various reasons, all of them perfectly understandable in the light of the recent tragedy. I would miss my new friends, especially my climbing buddy K. who had been so very supportive all along. He left his camera (mine had gone swimming at the start of the trek to base camp) and Z-rest for me to use, and shared his high-altitude snacks with the team, which caused us to ‘fight’ over Shot Blocks and chocolate. It was sad and discouraging to watch some of the Junkies – all of them strong and able climbers – depart. For me, however, leaving was not an option, and so, sticking to my savior routine, I made my way through the agitated base camp towards the first fixed line. Suddenly, I noticed two people on the trail ahead of me, with a large professional camera. ‘Here come the vultures,’ I thought, pulling the Buff over my face and hiding under the hood of my jacket. One of the reporters pointed his camera right in my face, and followed me without a word, until I – to him, apparently, an inanimate object – began climbing steeply up the path. The journalists’ obnoxious bluntness and insensitivity upset me. 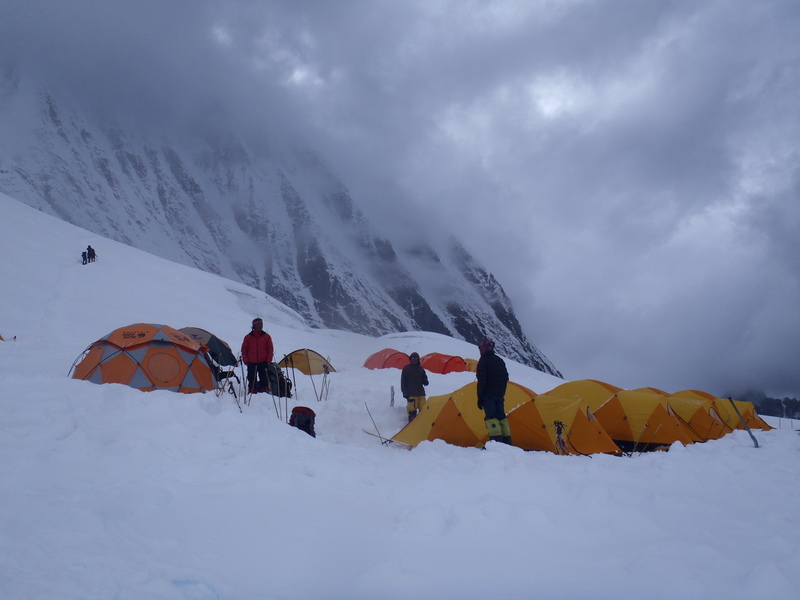 There were many people at base camp in those early days after the avalanche, keen on taking the most gruesome pictures or having their photo snapped in the epicenter of events. Like any tragedy, the Manaslu avalanche had its true as well as its self-proclaimed heroes, easy to tell apart even in the unhealthy excitement which followed the painful events of the 23rd of September. For my part, I wasn’t feeling like either a survivor or a victim – certainly, not feeling like any outside attention – and was simply trying to keep the resolve to carry on. When I reached my destination at the foot of the steep rocks, I saw a group of Sherpas coming down from Camp 1 carrying enormous backpacks. ‘Time to go home,’ one of them said to me, grinning. ‘Not yet,’ I replied quietly, talking to myself rather than him. But why was I so sure I had to stay, when so many people all around me were leaving? For several simple reasons: I was alive and physically unhurt, I was a climber, and the mountain I wanted to climb was right in front of me, its slopes made safer than ever by the recent slide. It helped, too, that I wasn’t afraid to stay, since the avalanche to me had not been something surprising or unusual in the ultimately unpredictable mountain environment. Mountaineering is an extremely dangerous sport: to human error or freak accident, almost every climber I know has lost at least one friend. I know that I, too, am not immune to mistakes or ‘bad luck’; I, too, can one day be referred to as somebody’s ‘lost climber-friend’. I accept and embrace this risk: I could not love the mountains as whole-heartedly as I do, if I didn’t trust them to know my time to go. If anything, the avalanche had made me value my time more than ever – so much so, I was not going to waste it waiting or hiding. In describing my reasons for staying, I speak, of course, only for myself. I don’t know how my team mates, who also stayed on the expedition, had really made their decisions or what their motivations might have been. The fact was that, in spite of the confusion around us, Phil Crampton’s Altitude Junkies, unlike most others, had the leadership, the support and the resources to allow those willing to try for the summit to do so. We stayed calm and focused, we rested, we waited for the right weather and, on the 27th of September, launched our summit push. Need I say that it wasn’t easy to walk back up to where I had run from just a few days ago? That I couldn’t close my eyes at Camp 1? That I cried all night long at Camp 2, pressing my mouth shut with my icy hands? That, as I climbed alone from there to Camp 3, it was not the thinning air that made me breathe erratically and try to move as quickly as my legs would carry me, but the biggest shame for being alive? That the night at Camp 3 – such a beautiful, clear night – was invaded by more ghosts and thoughts than my mind could contain? Yet, in spite of all this, of the mental and physical exhaustion, I was strangely happy to be where I live at my fullest: somewhere between love and loss, and good and evil, where there’s nothing to be afraid of anymore. I was the first to leave Camp 3 for Camp 4 on the 30th of September. I knew it would be the toughest of the days on the mountain for me: the steep climb is made long and exhausting by the decreasing pressure of oxygen in the air, the strong wind and the cold. I expected it to take me about 6 hours to climb from 6800 to 7450 meters, from where the Junkies would be leaving for the summit in the early hours of the next day. Four of the injis, including the leader, would climb without bottled oxygen. Our Sherpas, who would also climb without O2, all passed me within just minutes after I’d left Camp 3, all – smiling and moving unbelievably quickly under their heavy backpacks. I could never keep up with them, so I focused on making sure I could, at least, maintain my own slow but steady pace. It was very windy, and I climbed with my head down. Where a thick crust of wind-licked ice covered the slopes, I would hide under my down suit’s hood from the pieces of ice being kicked down by the climbers above me. Higher up, the wind felt even stronger, ceaselessly throwing clouds of snow in my face. 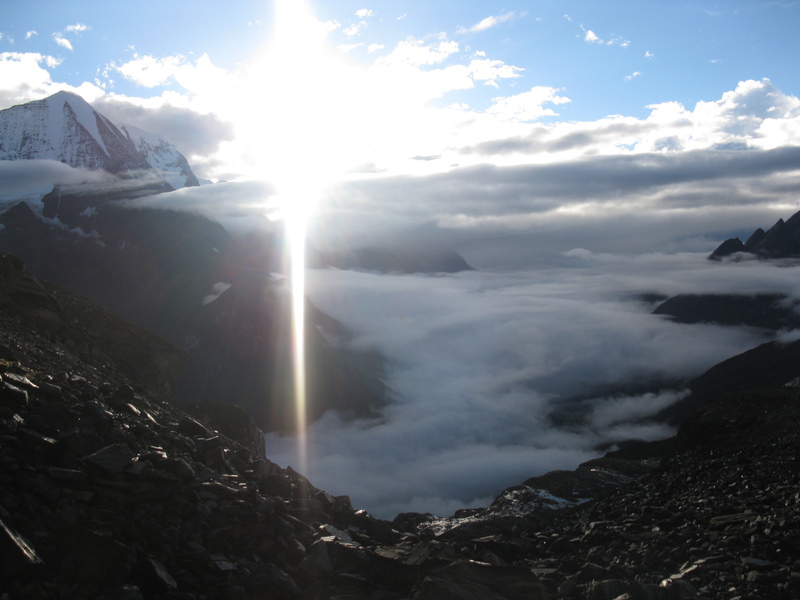 When I reached the long traverse into Camp 4, cold and tired, I started to meet climbers on their way down. They looked feeble on their feet – as, undoubtedly, did I – and complained about the cruel winds up high. Stumbling at last into Camp 4, I knew exactly what they’d been talking about: the tents flapped noisily, disturbingly, and people’s voices sounded loud above the wind. My second time at Camp 4, I realized, would be colder than the first one a year ago. I was happy that in the evening I would start using supplemental oxygen to help me preserve the remains of my warmth and energy. Once in the tent, I made sure I was as warm as I could be to provide for a good rest before leaving for the summit. Eating was out of the question but, following my climbing rules, I would drink a much as possible. 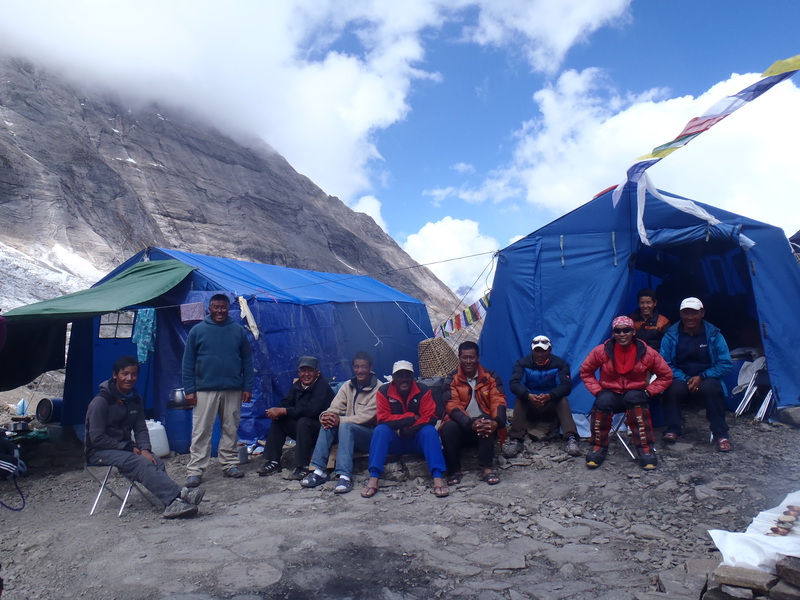 It was great to have my summit day climbing Sherpa, Pasang Wongchu, help my tent mate, E, and me to boil water. At 6 pm he set up our oxygen systems, and the three of us went to sleep – actually sleep and not toss and turn annoyingly in the sleeping bag, thanks to the O2. At 1 am we were to start for the summit of Manaslu. As I listened to the angry wind outside the tent, I wasn’t sure we would really be going. I was just thinking…you should write a book about you experiences some time…once again I’m captivated by your writing. Thank you! I don’t feel like I’ve done enough for a book, nor that what I have done is special enough – I wish :)… Few things are worse than a book that’s too big for its own story! It is special, for sure! Your approach and the way you handled it is humbling… And you were right to go on and climb! I’m glad and flattered that you think so! I never had a doubt that if I could, I should keep going.